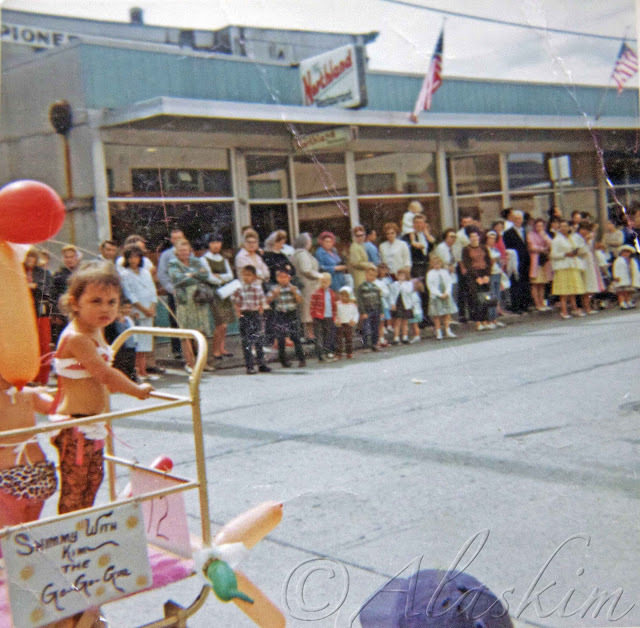 I was born and raised in the small town of Ketchikan, Alaska, where Independence Day was celebrated in grand style. I fondly recall weaving through a forest of grown-ups' legs, making my way to the front of the crowd to watch the 4th of July parade march down Front Street. I stared in open-mouthed wonder at the regalia-draped horses and laughed wildly at the Shriners in their funny hats and tiny cars. While recently looking through an old family photo album, I discovered some snapshots that document my younger sister's and my participation in the parade. I'd like to believe that our mother entered us into some sort of annual costume contest, but I have a sneaking suspicion that she just liked to dress up her daughters and show them off at the largest and most well-attended event of the year. Here I am at age 2 portraying a go-go girl. Yes, I said a GO-GO GIRL. Here I am at age 3 as a slightly dimwitted old-timey girl. MY MOTHER MADE THOSE DRESSES. The woman possesses mad sewing skillz. And here I am at age 4, transformed into a mermaid. You can't see my face, but I'm probably sticking out my tongue at that baby onlooker in the snappy yellow jacket and powder blue pants. 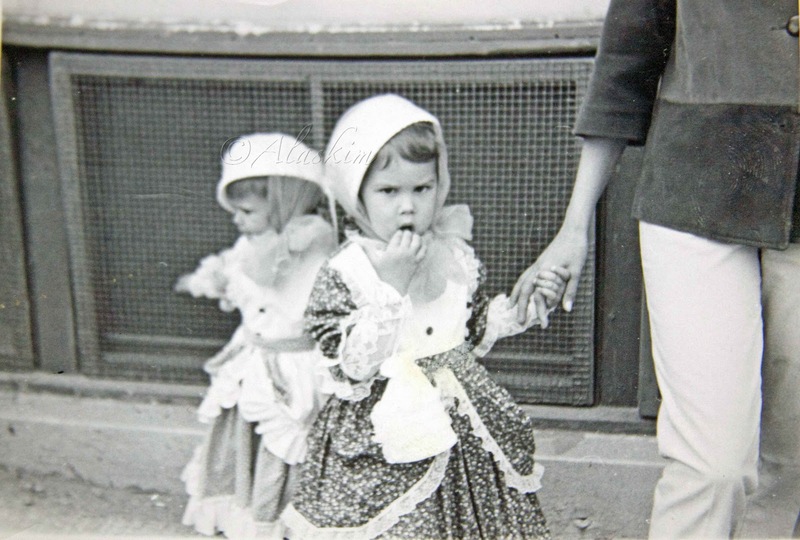 Again, my mother and her own two hands created those costumes. 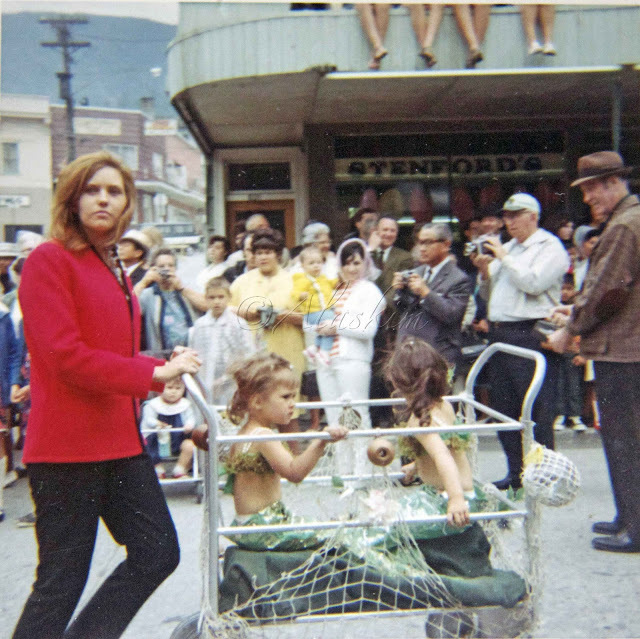 That's my mom in the red coat, by the way, who—had TLC been casting back then for Toddlers & Tiaras—would have kicked the butts of the other stage moms. Then taken their names. Then handsewn a sequined gown and put me in it. And now you know all you need to know about my early childhood. Except for my knee socks. I'm saving that disturbing post for last. These pictures are great. They make me want to see if I can round up some photos of my childhood - and then not share them with anyone. I love it. What a fun post!!! I love seeing old(ish!) pictures. Shimmy with the 2 year old go-go dancer! Ha! Thanks for posting! Those are some fun pictures! Your mom really DOES have mad sewing skillz! Thank you for sharing these! Love em! Your momma is awesome sauce! At least you were cute when you were young. My childhood pictures are atrocious.